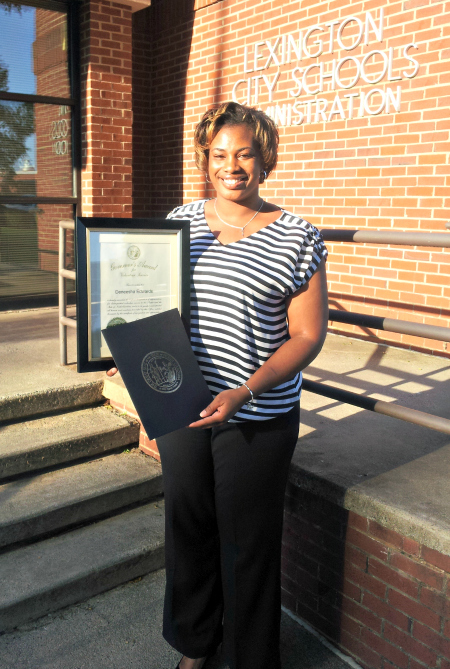 Deneesha Edwards received the N.C. Governor’s Award for Volunteer Service during the Lexington City School Board of Education meeting on May 6. On May 6, Communities In Schools of Lexington/Davidson County mentor, Deneesha Edwards was presented with a North Carolina Governor’s Award for Volunteer Service during the regular meeting of the Lexington City School Board of Education. Edwards was one of only three volunteers in Davidson County to receive this award, which recognizes individuals, groups and businesses across the state making significant contributions to their community through volunteer service. Edwards was nominated by Communities In Schools based on her outstanding commitment to being a stable, caring presence in the life of her mentee, Ja’Nia, currently a sixth grade student at Lexington Middle School. “Deneesha is everything we hope to see in our mentors and more. She is committed not only to helping her mentee, Ja’Nia reach her true potential, but to helping CIS achieve our larger goal of preventing dropouts by providing a support system to deserving kids in need of extra attention,” said Ryan Jones, executive director of CIS. Edwards began working with Ja’Nia at Charles England Elementary School in 2011. Over the last three school years, Edwards has helped Ja’Nia develop positive social habits and understand the importance of setting goals and staying focused.